This art was made by artists in our after school, homeschool, and Saturday morning art classes. These artists thought about climate change, and looked at images of monsters and heroes that artists have made throughout history. Then they created their own paintings and sculptures about the monsters creating climate change, and the heroes saving us from it, including themselves. Come celebrate our artists, enjoy our exhibition, and make some art you can take home with you! Adults and children are all invited. If you can't come to the opening, you can see the show any time the library is open: Tuesdays and Wednesdays, 12pm to 8pm, Thursdays, 10pm to 6pm, Fridays and Saturdays, 10am to 5pm, and Sundays, 1pm to 5pm. This art was made by artists in our after school, homeschool, and Saturday morning art classes. These artists looked at the world around them, got inspiration from great artists of the past, and created their own paintings and sculptures. Their work combines observation, invention, and imagination. exhibition, and make some art you can take home with you! Adults and children are all invited. If you can't come to the opening, you can see the show any time the library is open: Tuesdays and Wednesdays, 12pm to 8pm, Thursdays, 10pm to 6pm, Fridays and Saturdays, 10am to 5pm, and Sundays, 1pm to 5pm. middle schoolers applying for Creative and Performing Arts High School. These artists explored how to represent both what they were seeing and their own artistic vision. This artwork was inspired by African wax cloth prints and African doll sculptures. The artists in our after-school and Saturday morning art classes admired both the meaning and the beauty of these works, and studied them to spark their own creativity. exhibitions, and make some art you can take home with you! Adults and children are all invited. A BIG SHOUT OUT AND SPECIAL THANKS to everyone who came to the Art Build for the Walk for Green Jobs and Justice! Everyone loved the giant sunflowers we made. They made the walk so celebratory! Thanks again for being part of my dream: working together with other people to create art for the purpose of transforming our world. We continue to find inspiration in the figure! Come see paintings and sculptures of people that show each artist's creative interpretation of the human form. This show features the work of studio artists Jordan Butler, Rysan James, and Chantal Peden, as well as children who were in spring art classes and summer art camp. You and your children are invited to celebrate our artists and to make some art with us! Children, tweens, and teens, and adults are all welcome to come view the exhibition and make their own work of art to take home. This exhibit shows work made during "Artstory," an interdisciplinary art and history summer camp that happened at Mindy Flexer Art School and Grumblethorpe Historic House. Come see history come to life in creations inspired by Native American and Colonial American art. You and your children are invited to make some art with our artists at the end of their show! Children, tweens, and teens, and adults are all welcome. Parents, please plan to take your child's artwork home after 3:00pm. 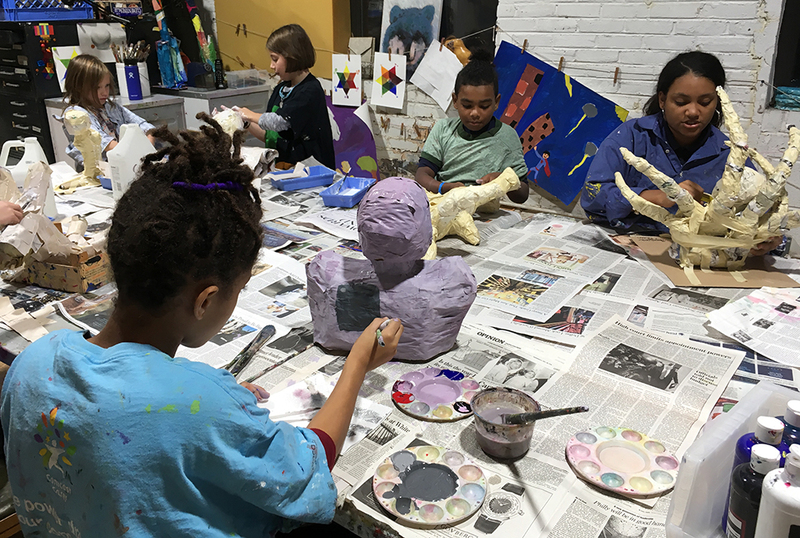 We were inspired by figure paintings by the great African American painter Lois Mailou Jones, and by the sculptures of Marisol, one of the prominent women artists in the Pop Art movement. The student artists in Figuring Out the Figure used this work to spark their own imaginations, as they created all kinds of people and creatures. Come see how they turned their ideas into reality! We were inspired by many traditions this spring: we delved into the old arts of drawing, printmaking, sculpture, and textile-making, and also used new ideas from pop art. The artists in the show used these traditions to fuel their own artistic expression, and what they made is as unique as they are. Come see our creations! In celebration of our show, build or draw your own creature or plant, using our artists’ work as inspiration! If you can’t come to our reception and make-in, you can see the show Mondays & Wednesdays, 10am - 5pm, Thursdays & Fridays, 10am - 5pm, and Saturdays & Sundays, 10am - 5pm, through December 13. Greene Street and Chelten Avenue, Tuesdays & Wednesdays, 12pm to 8pm, Thursdays, 10am to 6pm, Fridays & Saturdays, 10am to 5pm, through early June. Come meet our artists and make your own paper quilt square! Children and adults are all invited.